Our first-of-its-kind group buy deal for Tiq Home Insurance is now open! Enjoy exclusive discounts and rewards in addition to current promotions and offers for Tiq Home Insurance. 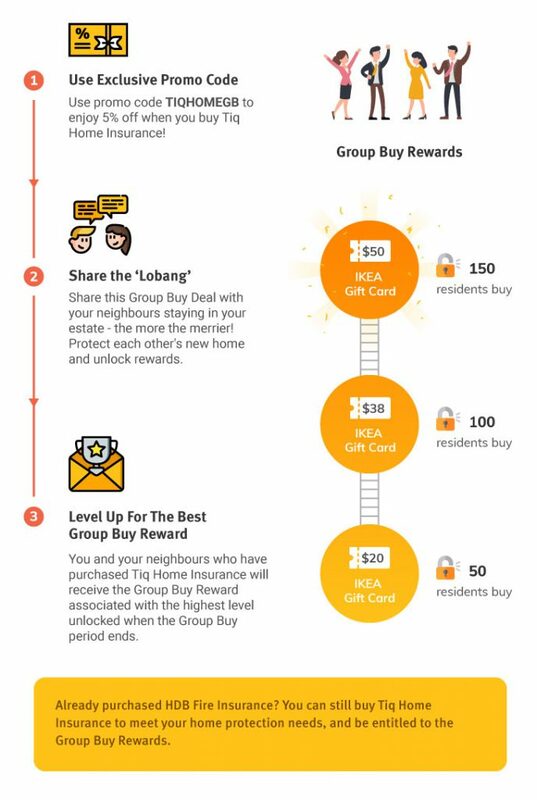 Bask in the kampong spirit and unlock exciting rewards with your soon-to-be neighbours while protecting your dream home! There are currently no participating estates. Please check back for more updates or drop us your details at the bottom of the page if you are interested to be part of the Group Buy. expertise to protect your home. can choose to protect renovation, home contents and all the things you love, only paying for what you need and nothing more. Already bought HDB Fire Insurance? protection. Tiq Home Insurance by Etiqa provides comprehensive coverage for your home contents, renovation and belongings. Unsure about the difference between the mandatory HDB Fire Insurance and Tiq Home Insurance? Learn more here. Interested for your estate to be part of the Group Buy? Drop us your estate name (eg. Buangkok Parkvista, Toa Payoh Apex) and contact details if you are interested to be part of the Group Buy and find out how you can get attractive rewards! Who is eligible for this Group Buy?This Group Buy is currently only open to residents of participating estates mentioned above. However, we are happy to invite more estates (BTO, ECs, Condos, etc) to participate in the group buy. Kindly let us know by completing the above form and we will get back to you. How does this Group Buy work?All you have to do is to purchase Tiq Home Insurance and apply the promotion code ‘TIQHOMEGB’ upon checkout to receive an additional 5% discount. After you have made the payment, you will be automatically enrolled under your respective Group Buy residents’ pool. You will be able to see the number of residents who have bought the Tiq Home Insurance under the “Check Your Progress” section and the corresponding rewards unlocked on the Group Buy website. How long is the Group Buy promotion period?The Group Buy promotion period varies for all estates. Please refer to the “Check Your Progress” section for the promotion period. When will I receive the reward?After the promotion period, residents will receive a redemption email after the 14-days free look period to ensure that there are no cancellations of the policy, which may affect the reward level tier. Can I still join the Group Buy when the promotion period is over?No, any purchases made after the promotion period will not qualify as part of the group buy, even if you are from the participating estate. Do all interested residents have to purchase concurrently in one transaction to qualify for the group buy?No, residents can buy Tiq home Insurance separately, at any time during the promotion period and they are not required to transact in one transaction to qualify for this promotion. We will enrol you into the Group Buy pool as long as you reside in the participating estate.